Darlene here. No doubt you’ve all heard about the horrible storm that hit NYC; which is where the whole Urban Amazon team lives. Fortunately we’re all safe and Ann made pot roast (yes, Ann’s pot roast is a fortuitous event). As New York comes out of the dark times (literally now that the power is restored in lower Manhattan) thousands are showing up to volunteer – even having to be turned away in many location. 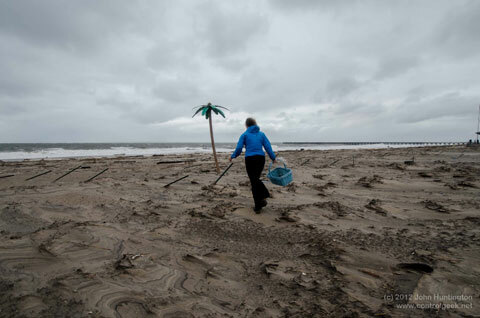 There are some in NYC whose lives will never be the same with what Sandy has taken from them; but for the majority of New Yorkers the storm was a break in routine and a shift from their normal mode of living. Unexpected shifts like this grant us the opportunity to reflect, discard unhelpful patterns, and improve our day to day living. This lesson isn’t only useful for New Yorkers waking from Sandy-fog; anyone dealing with an unexpected break in routine can harness the lessons from it. You get an extra hour today, can you spend it reflecting? Unexpected challenges that break routine create opportunities for neuroplastic change – literally your brain rewiring itself. The best example I ever heard of this kind of change in adults was falling in love. Ever had that feeling after a few months with someone new that you actually are a different person? That’s because you are. The act of falling in love releases chemical compounds in the brain that allow you to rip up old patterns and form new ones that complement your new Beau (or Betty) so the two of you will grow together. That’s why you’ll wake up three months later to a completely new life. While it’s much harder to form these new patterns without the benefit of a fling, it can be done. Unexpected challenges, like Superstorm Sandy, interrupt your routines and create the window through which to do so. What about the last week felt more natural and fit better in your life? What did you really miss? What habits can you use this reset as an opportunity to break? Are their old habits you picked back up from this stressful time? Any other old modes of operating that you reverted to? Did your mind and body desperately need this break to relax? Could that mean that you’re asking too much of yourself day-to-day? Are you dreading returning to your job/home/boy or girl friend/any other people or things when this is over? These meditation/reflection triggers can also be used after a breakup, quitting or getting fired from an old job, or a move. Maybe you don’t act on these things right now; maybe you don’t have the energy or time now that the storm is over. But allowing yourself to recognize the way you truly feel creates space for change down the line. If you are in a place in your life where you can, then change. Why waste time on something you know isn’t working? Sorry to hear you were struggling; but glad you had a centering practice to fall back on. Any advice to give others on how you got started? Amazing thoughts about taking time to reflect! Love changes you, even bad love can change you for life. Thankfully my life has finally found a path that is peaceful, and soothing. I am trying to find the needed space for change and the time to care for myself. thought provoking post that speaks volumes. Very thought-provoking and excellent post! I couldn’t agree more. 1- Four days without power helped me break my Hulu addiction. 2- Five nights sleep in total dark and silence forced me to experience what good quality sleep feels like, and now I’ve seen the light : ). I’ve lived in NYC my whole life, and have gotten used to “sleeping” with lights on, through neighbors/roommates/family members’ TV’s blaring, and all sorts of inside and outside noises. I can’t make the city dark and quiet again, but Sandy forced me to make the changes I needed to create a healthier sleeping environment.